Graduates who will cross the stage Sunday are more likely than their 2011 counterparts to have jobs secured for after they turn their tassels, according to a national survey that shows positive prospects for the Class of 2012. More than 25 percent of seniors across the country reported already being employed, according to a National Association of Colleges and Employers survey released May 9. That number shows just a slight increase from this time last year, when 24 percent of graduates from the class of 2011 reported landing full-time positions. Seniors are also seeing higher pay out of college, with median starting salaries for recent graduates up 4.5 percent this year, at $42,569, the organization reported last month. “It is not surprising that job growth may be faster among college graduates than among others in the labor force,” Chiswick said. The economy is still uncertain though, Chiswick said, as external forces like the European debt crisis can upset internal forces like consumer confidence and the housing market – possibly disrupting the projections. The Class of 2010 saw a 62 percent rate of full-time employment within 6 months of graduation, according to the most recent data available from the University’s career center. 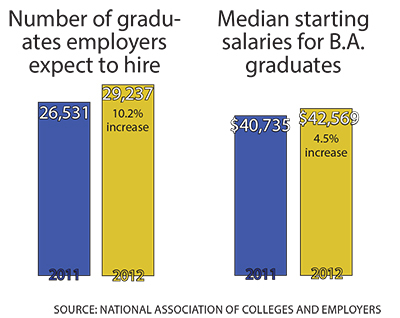 Communications coordinator for the Career Center Jeff Dagley said graduates have reported similar statistics for the past few years, adding that he does not expect a deviation when the Class of 2011 figures are finalized later this year. The office did not return a request for comment regarding when the figures would be formalized. Despite the brightened job market, senior Sara Tehrani said she thinks many desperate graduates will take any job that comes their way. “I know a lot of people who are willing to take basically anything at first. Obviously, the majority of us are not going to get our dream job right out of college, but I’m hopeful,” Tehrani, who will earn a degree in English next week, said. Tehrani has been accepted to the University of Connecticut’s law program, but said she is holding out for a job offer she can get excited about. Employers are also projecting an increase in hiring for the third straight year, expecting to hire 10.2 percent more college graduates this year, according to a March report by the National Association of Colleges and Employers. The only industry projected to hire fewer graduates this year is chemical manufacturing, which has an expected 16.2 percent decrease in hiring, the report showed. Last year, out of 14 total industries studied, only government and finance reported expected decreases in hiring of college graduates. Senior Rupalee Rashatwar said that while she does not have a job lined up for next year, she has gone through three rounds of interviews with a law firm from which she hopes to receive an offer in the next week. As a graduating senior, Rashatwar said she had a better shot than applicants with large gaps of unemployment on their resumes, which she said employers look down on. She added that before her recent round of interviews, she felt like she was part of a minority of graduating students without plans for work, but is more hopeful after the recent employment reports. Kierran Petersen contributed to this report.